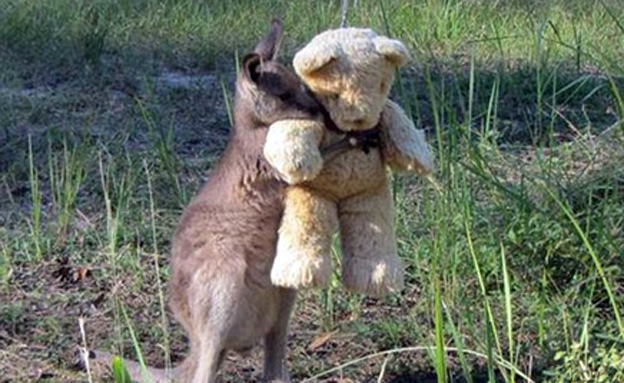 Kangaroo Dodlbag became an orphan named after the network sensational shot as he hugged tightly stuffed teddy bear which was a gift from his therapist. Sweet image first appeared yesterday (Wednesday) Twitter account in Australia and worldwide partner. "I figured so much that picture should be shared with Australians," said Tim Bashir, published her first, "but I did not imagine it will reach Brazil." Dodlbag kangaroo covered fell from his mother, who apparently died when he was only two months old. The photographer's mother took him under her wing as part of the company "Shears" saves wildlife, and moved him to treat Wales. Although in frail health, the company managed to help Ldodlbag fully recover and today is already bouncing him around the forest, say the company. "Every time he comes to us to feed or just to get a hug."